This Saturday is one the biggest rivalries in college football, and chances are you have never heard of it. In Division III football, deep in upstate New York, Ithaca College takes on SUNY (State University of New York) Cortland. Only 21 miles separate the two schools. It’s a really fun rivalry, one I got to experience personally last year. And this year’s game, which originates from Cortland, New York, should be loads of fun. Both teams are 7-2 overall and Ithaca is 4-1 in the Liberty League, while Cortland is 5-2 in the Empire 8. The winner of this game receives the famous Cortaca Jug. In 1959, Cortland’s football captain at the time purchased a $2 jug from a farmer in upstate New York. Him and his friend, the captain of the Ithaca team, decided to paint the jug in their respective school colors and thought that it would be cool if whoever won the game, takes him the jug. Apparently the schools agreed that it was cool and the jug has been award to the winner since 1959. After each victory, the winner team paints their school name and the score by which they won. The two schools are presently on the third overall jug, as the first two were filled up. 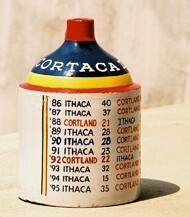 Ithaca leads the Cortaca Jug series 36–24. The all-time series goes beyond just the Jug, and Ithaca holds a 40-33-3 all-time edge over their rivals). Ithaca won last years game 48-20. They jumped out to an early 20-0 lead and led 34-6 and never looked back, snapping what was previously a 7 game winning streak by Cortland from 2010-2016. Ithaca QB Wahib Nabi completed 27-37 passes for 329 yards and threw for 6 touchdowns. WR Andrew Vito caught 10 passes for 116 yards and a TD and Will Gladney, one of the school’s top WRs of all-time, caught 5 passes for 91 yards and 2 TDs. All three men return and should play prominent roles in the 2018 game. Ithaca is one of the top D3 football programs in the country. Coached by Dan MacNeill, who is in his 22nd season as head coach. He has a record of 140-79 and has made 15 postseason appearances, including six NCAA tournament showings. He ranks first at Cortland in both career victories and career winning percentage (.639). Being in Division III means neither team has a large pro sports presence, but there is some presence and I have done my best to uncover the history of both programs. NFL Experience Joe D’Orazio – the only Ithaca football player to ever play in the NFL. He only played 5 games for the Detroit Lions in 1944. R-Kal Truluck – the only Cortland football player to ever play in the NFL and he had a pretty successful run. At Cortland he started 27 games (played 35), recorded 238 tackles, 21 sacks, 2 forced fumbles, 2 fumble recoveries, and 7 passes knocked down. He was undrafted in 1997. He spent time in the NFL with the Chiefs, Packers, and Cardinals. He also spent time in the Canadian Football League and Arena Football League. MMA Conor Heun – sticking with the fighting category, Heun is a former mixed martial artist, who has a 9-5 career record. He fought in “Strikeforce” before the company was absolved by UFC and has not fought in a UFC event since. Tamdon McCrory – 14-5 MMA record. His last fight was in October 2016 in UFC. Actor Kevin James is a Cortland alum. Also, not an alum but Jacksonville Jaguars head coach Doug Marrone was Cortland’s Tight End Coach in 1992, his first coaching opportunity. 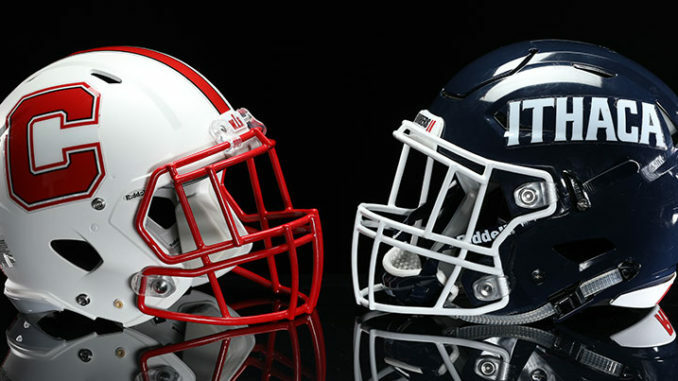 Which school will paint up the jug after Saturday – will it be Ithaca or SUNY Cortland?